Giulia Cortella "NEW YORK I LOVE YOU A PERSONAL DIARY OF JEFF BUCKLEY "
How can we speak with Jeff? Hi Giulia--you are very welcome!! Thanks for the nice words and I LOVE your book! I read it this morning. So sensitive and poetic. Just like Jeff. Now my book on sale with shipping free for Italy! 50% off of shipping for other countries! A PERSONAL DIARY OF JEFF BUCKLEY"
written in english and italian so you can read both version in the same book!! Ciao Guys from Verona Italy THE CITY OF ROMEO AND JULIET!!! Jeff Buckley zodiac and ascendant sign from "Astrotheme"
News from Gary Lucas on the cover of Italian music magazine "Just Kids" this month! 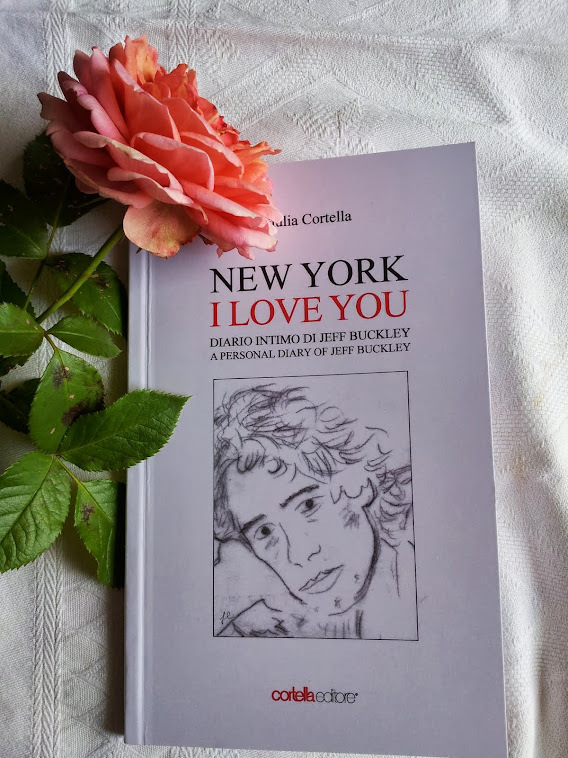 My book "New York I love you A personal diary of Jeff Buckley"
WITCHES' RAVE! A WILD BIT OF LOVE! During his life, Jeff Buckley lived what could be seen as four magnificent seasons. The first, a Winter, in California, where from his birth, dense clouds prevailed over his destiny and fatal omens crowded his young life! A fortunate Spring, in New York, a time of love and hope and where his talent was discovered. Where he found a loyal partner in life, Rebecca More, who loved him in return and with whom he achieved two fold a dream. A dream which he had never consciously conceived! A suffocating and hot Summer, touring endlessly around the world, where his voice charmed the globe and the fruits of his heartfelt labor spread far and wide! And finally, an Autumn, a sunset, the moment when it all came to an end! The last season of his life, lived in the South of the U.S.A., where the great river, with force enfolded him into its arms and swept him away from us, Forever! And so while living only one admirable cycle of life, he traveled to all four of the cardinal points of the world … From California, in the East, to New York in the west and then North to Europe. Here during his tours he explored all the amazing places that the globe offered and many had the great fortune of knowing him. And then in the end, tired from all his roaming, he set his sails to follow the moon and found refuge in the South, in the warm cotton fields. In the South where American music has its origins, in the south where he felt his mother’s sunny nature, in some way, calling him to her. And while a trip to Panama, with his new partner, Joan Wasser, had been planned, he never got the chance to set sail or explore what lay further South. 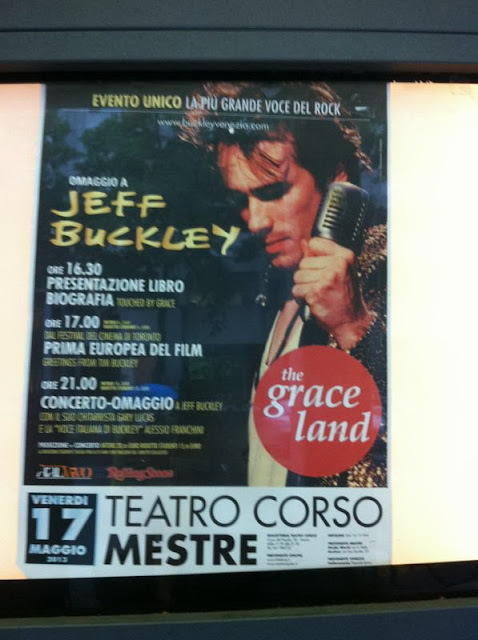 Jeff Buckey ha vissuto nella sua vita quattro stagioni. Una prima d’inverno, in California, alla nascita, quando nubi si sono addensate sul suo destino e presagi funesti hanno minato la sua giovane vita. Una primavera fortunata a New York, una stagione d’amore e di speranza in cui si è dischiuso il suo talento ed egli ha trovato vicino a sé una compagna fedele, Rebecca Moore, che ha ricambiato il suo amore e con la quale ha realizzato un duplice sogno, forse nemmeno coscientemente concepito. Un’estate calda e soffocante in giro per il mondo, impegnato in concerti estenuanti, perché i frutti del suo cuore fossero a tutti distribuiti e la sua voce potesse incantare il mondo. Un autunno, al tramonto, il momento della fine, la stagione ultima della sua vita, nel sud degli Stati Uniti d’America, dove il grande fiume l’ha confuso con se stesso, l’ha abbracciato troppo forte, portandoselo via da noi per sempre. Così, come egli ha trascorso un solo mirabile ciclo di vita, ha parimenti viaggiato per i quattro punti cardinali: dall’ovest, in California, all’est, a New York e poi al nord in Europa e ancora, tutto intorno, ha esplorato lo spazio del mondo, nelle tournée dei suoi concerti, nei quali molti hanno avuto la fortuna di conoscerlo. E alla fine, stanco di viaggiare, ha diretto le sue vele a mezzogiorno, si è rifugiato nel sud, nelle terre calde dei campi di cotone, a sud, dove la musica degli Stati Uniti aveva avuto la sua origine, a sud, dove sentiva che la natura solare della madre, in qualche modo, lo richiamava a sé. Un nuovo viaggio a Panama con la sua nuova compagna Joan Wasser era già progettato. Ancora più a sud egli non ha avuto il tempo di salpare. I don’t know why I am here. If I think back on my life, this is the only question to which I have no answer. It was so wonderful that night, in the water, strong and icy water, a vigorously overpowering wave that I needed ... A dive into happiness. Why am I dead? Why did I so stupidly sore away or better sink so deep that I could no longer breathe nor live? Why? I know that you are asking yourselves the same thing, that this death did not shock only me. So together let’s look at the endless reasons for death so that it assimilates a coherent meaning. A meaning that is clear for us, more familiar, so much so that it becomes acceptable. Let’s enclose this death into a logical pattern, in the plausible circle of life, a fatal life. But instead we cannot, as it can’t be done with me. I am not the usual madman. It is impossible to confuse me with others, to understand me or rate me. Here he is, the mysterious white boy that you would have liked to meet. The boy of dreams, fruit of a dream himself. An unknown talent, an unpredictable, foolish minstrel that passed on in this way, amongst the laughter that fades in the dark, at the fall of sudden silence, on the horizon of a dull May evening. I still love you all, as I always did during my brief life and wish you could feel this corresponding love, although in some way I know that you do. I miss you, all of you and even now I feel a bit lonely, as I used to so long ago! It was beautiful that evening, at the closing of the spring, beautiful and so terribly sad, as with many other things in life! Although during this moment of sadness, I was still able to be happy and I was and so the two contrasting emotions battled on against each other. For me it was a frequent occurrence, those days where you felt suspended in time, waiting for something to happen, in an undefined and curious state. That day had not been anything special, just a day to end a stretch of hard work that had finally come to an end. But I felt confident and free, like a boy from the mountains with good shoes and a head on his shoulders. I have pale skin, so pale and delicate that at times my eyes stand out and are sunken at the same time! My face is sharp and defined, I am not handsome but not to be discarded either! I am sensual, if you listen to the ladies and my name is Jeff Scott, and to wear it is also to be a Buckley! I remember from that night, the great river that for days had been enticing me into her waters! Those waters that flowed towards the Mississippi! Yearning for the embrace of the Father river of all American rivers. That current, that immense stretch of water, pushing in one direction, sure, fast and fascinating, invited me in. As had often happened at other moments in my life, I was used to improvising, seizing the moment, welcoming unpredictable situations, even the most unexpected ones! “Whole Lotta Love!” was the most amazing rock song, written just after my birth. I love Robert Plat’s voice, which you might agree, is very similar to mine! What energy, strength, fantasy and life there is in this song “Whole Lotta Love!” We, my inseparable companion and I, sang at the top of our voices to the radio! My heart felt strong and at that moment I dove into the river, fully clothed. I am the crazier of the two, the real madman of the group, the fool, the funny guy, the ridiculous man. “Whole Lotta Love!” I am the one without brakes, the one that must always take things to the extreme, experience things first hand! And from these dangerous and unusual experiences, I would transform, the intense emotions, into music! Music is like a river for me, where all the streams flow into one great current. Just like this wonderful river that is inviting me in, even though the sky and waters are darkening. Now I remember that icy water, strong and full of vigor and life! That water, that after so much work, I decided to dive into so as to feel content and full of glorious sounds. Why, why that night, at the onset of dusk, at the moment in which the river flowed even more and with heavy shoes that bound my feet so that I couldn’t swim? I remember how my clothes were soaked and slowly wrapped around me in a frozen grip, weighing me down unexpectedly. I found myself battling the water, using all of the energy that I had to stay afloat, as I am unfit; to swim, to beat the cold in a senseless fight between the river and I. Further and further away from the banks I move, into the vibrating water that becomes stronger and stronger. I battled my way towards the opposite bank, towards the far off landing, on a dangerously foolish and impossible crossing until all of a sudden, with a final unpredictable push, I tumbled over and over in the water … and then there was nothing! The air of the South is charged with an array of perfumes. It is a sweet and welcoming place for a so called gypsy like me, who was always in search of new emotions! These places filled me with rhythm and melodies and now I am ready to leave again with a new love in my life. Years have gone by and still I have not had enough time to create music, write fully and compose freely without the suggestions of others and the need for substances, drugs, alcohol or without being dammed. Inside me lies an extraordinary attraction to life, to its shapes and colors and lights that for me become notes, sounds, cords and melodies. Until now I have expressed too little of myself. I have not had a break and I am a bit tired from all this fame that is behind me. Tonight I need to recharge, I want to dive into the waters and wash away the pressures that I carry. My life was intense! I have felt pain and joy, discomfort and hope. I have known many, loved powerfully and been loved immensely. I have always been backed up by personal pride and a lucid disillusionment of life. But it is this act of love that surrounds you in the light or darkness, at the moment of death! Life has been a challenge ever since I was a small boy and I grew up quickly, as is the case with any child that lacks the love of a parent. I always filled the void by listening to music, all kinds of music, harmonious, strange, deafening, sweet, exotic, melodious, screaming, sad or eerie music. I have always listened to music, I was born with music and song and now here I still sing and play as always. Why am I here? Suspended, passive and surprised! I am surprised by the love there is in the world for me and that I am unable return that love even though I would love to! I would love to be able to sing about the love that is growing for me. I should have considered your love, remained close to you but now I am suspended and far away and although I am not sad, I wait! I know that I will see you soon, I will see my most dearest soon and those that loved me and that love me still. I know that we will live in the most beautiful light and everything will finally come together in harmony and no longer will there be conflict! I have found my father here and finally I am with him! No longer can he escape me and now we are always together and he is happy! He says that now he knows what life is, what life’s real meaning is and he squeezes my hand as if he is scared I will run away from him as he did from me! “What are you doing here little soldier?” he asks and how strange it is. He is like a kid to me, as I am in fact older than him. This makes me sad but I love him and reassure him that I will never leave him alone. I too am surprised! “I am not sure what I am doing here either!” I say and we look into each other’s eyes in silence without knowing what to say! Our similarities, our brief lives and the blood that runs through our veins attract us to one another even though we are like strangers! And not even you can tell me dad! You who so stupidly passed one evening in summer! I feel so alone. I wish that my mother could be here to help me find the courage and strength which to tell the truth often I lack. And when the loneliness and unanswered questions fall at our feet, here is my voice and I find myself again. Music is all that I am, even here I sing but with my father! Our voices blend together and it is beautiful and only now do we understand each other fully and discover how similar we were and are! I miss you all, I was happy to live! This is the myth of an unfair death by happiness! Non so perché sono qui. Se ripenso alla mia vita l’unica cosa alla quale non so rispondere è questa. Era così bello quella sera nell’acqua, un’acqua gelata e forte, un’onda travolgente di vigore di cui avevo bisogno... un bagno di felicità. Perché sono morto? Perché me ne sono volato via così stupidamente o meglio sprofondato così tanto da non poter più respirare, né vivere? Perché? So che ve lo chiedete anche voi, che questa morte ha sconvolto più di me. E allora troviamo insieme infiniti motivi per morire in modo che la morte assuma un significato coerente, comprensibile a noi, più familiare, tanto da poterla sopportare, inquadrarla, questa morte, in uno schema riconoscibile, inscriverla in un cerchio vitale plausibile, fatale anche. E invece no, non si può, con me non funziona. Non sono il solito sballato fuori di testa, impossibile confondermi, schedarmi, comprendermi. Ed ecco il misterioso ragazzo bianco che avreste sempre voluto incontrare, il ragazzo dei sogni, frutto di un sogno egli stesso, inconsapevole talento, imprevedibile, folle menestrello che si spegne così tra le risa che si smorzano nel buio, nel silenzio che cala all’improvviso, nell’orizzonte monotono di una sera di maggio. Vi amo tutti, ancora, come sempre vi ho amato nella mia breve vita e vorrei che poteste sentire la mia corrispondenza d’amore e so che per certi aspetti questo accade; mi mancate, tutti, e mi sento talvolta ancora un po’ solo, come mi accadeva ormai tanto tempo fa. Era bello quella sera che si schiudeva all’estate: bello e dannatamente triste, come tante altre cose della nostra vita. Eppure anche nella tristezza mi è capitato di essere felice ed io stesso ero allora ebbro di due sentimenti opposti in lotta tra loro. Mi capitavano spesso quelle giornate in cui ci si sente sospesi in attesa di un evento, in uno stato d’animo curioso e indefinito. Quel giorno non era stato un gran che, una di quelle giornate che concludono una serie faticosa che finalmente volgeva al termine. Ma io mi sentivo libero e sicuro di me. Testa fina e scarpe grosse, come un ragazzo di montagna. 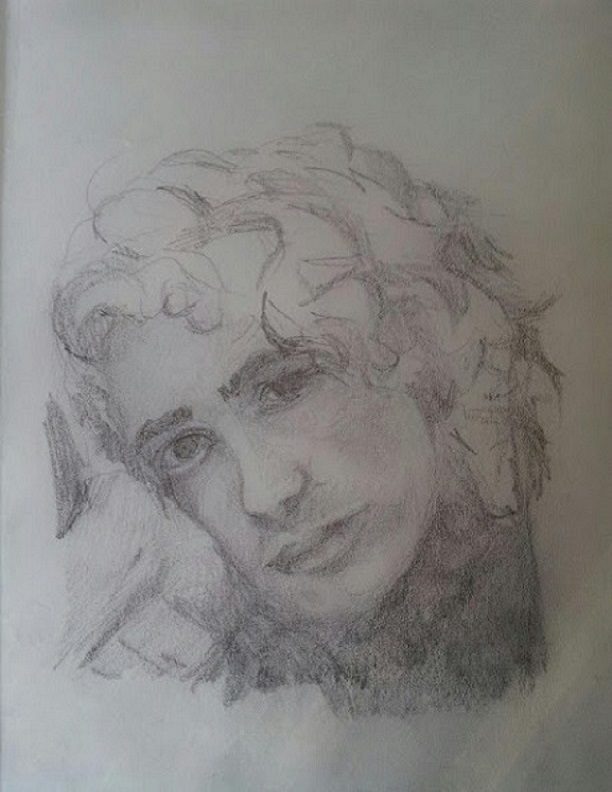 Ho la carnagione chiara, talvolta così chiara e sottile che i miei occhi vi possono risaltare e insieme affondarvi: lineamenti decisi e nitidi, non sono bello, né da buttare. Sensuale a sentir le donne, il mio nome è Jeff Scott e che fatica essere anche Buckley. Ricordo di quella sera il grande fiume che mi invita da giorni nelle sue acque, quelle acque che corrono al Mississipi, che anelano l’abbraccio con il padre di tutti i fiumi americani; quella corrente, quell’immensa distesa d’acqua in un’unica direzione sospinta, sicura, veloce, affascinante, mi invita. “Fermiamoci un po’ qui alla riva”, come tante altre volte nella vita sono abituato a fare le cose che capitano, così, al volo, e cogliere le situazioni più improvvise, più inaspettate. Il cuore mi batte forte e mi tuffo vestito nel fiume. Sono io il più matto dei due, il vero matto del gruppo, the fool, the funny guy, the ridicolous person.”Whole lotta love!” sono quello senza freni, che prova tutto fino in fondo, sulla propria pelle, in modo estremo e che, le situazioni pericolose o fuori dal comune, le sensazioni profonde le trasforma in musica. La musica per me è come un fiume, come degli affluenti che si riversano in un’unica corrente, come questo che mi è davanti invitante nonostante l’imbrunire del cielo e delle sue acque. Ricordo adesso quell’acqua gelata, forte, travolgente, piena di vigore e vita, dopo tanta fatica per me, un bagno di felicità e sono ebbro, la testa piena di suoni. Perché? Perché proprio quella sera, all’imbrunire, in quel momento, quando il fiume corre anche di più e le mie scarpe grosse mi impediscono di essere pesce come vorrei? I vestiti si inzuppano, mi gelano lentamente, zavorrano inaspettatamente il mio corpo e allora ecco mi ritrovo a lottare con l’acqua, un mondo più forte di me a far ricorso a tutte le mie energie, quelle poche che ho - a dir il vero, non sono molto allenato - per restare a galla, per nuotare, per vincere il freddo in una gara senza senso tra me e il fiume. L’aria del sud è carica di profumi, è un luogo dolce e accogliente per me, sempre un po’ zingaro in cammino in cerca di emozioni. Questi luoghi mi hanno riempito di melodie, di ritmi, sono pronto per ripartire e ho tanta voglia di vivere. Sono passati anni e non ho avuto ancora il tempo che volevo per creare musica, scrivere pienamente, comporre liberamente senza bisogno di suggerimenti, alterazioni, senza diventare maudit. Vi è dentro di me un’attrazione straordinaria per la vita, le sue e forme, luci, colori che diventano in me note, suoni, accordi, melodie… sono riuscito finora ad esprimere troppo poco di me, non ho avuto tregua, sono anche un po’ affaticato da tutta questa celebrità che mi lascio alle spalle … Stasera, dopo tanto tempo, ho bisogno di rigenerarmi, ho voglia di nuotare. Sono felice e infelice al tempo stesso. Se ripenso alla mia vita posso dirvi che è stata intensa, che ho provato dolore e gioia, sconforto e speranza, ho conosciuto, ho amato, con forza sono stato amato, molto, sostenuto da un intimo orgoglio e da un lucido disincanto nei confronti della vita che è tutta nell’atto di amore che porta alla luce e nel buio che avvolge al momento della morte. Ho provato tutto fin da piccolo e sono cresciuto in fretta, come tutti i bambini che, bene o male, sono sradicati in parte dell’amore di un genitore. Ho colmato il vuoto ascoltando musica da sempre, musica di tutti i tipi, armoniosa, strana, assordante, dolce, esotica, melodiosa, acuta, stridente, inquietante, disarmonica. Ho ascoltato musica da sempre; sono nato nella musica e nel canto e anche ora qui canto e suono, ancora come sempre. Perché sono qui? Mi sento sospeso e distaccato, e stupito, anche. Sono stupito dall’amore che c’è nel mondo per me e che io non posso ricambiare mentre lo vorrei, vorrei poter cantare l’amore che vedo crescere per me. Avrei dovuto considerare il vostro amore, restarvi più vicino mentre ora sono sospeso, e distaccato, ormai, ma non sono triste: aspetto. So che ci rivedremo presto, presto vedrò le persone più care, e quelle che mi hanno amato e quelle che ancora mi ameranno: so che vivremo nella luce più bella e tutto sarà finalmente ricomposto in armonia senza più conflitti. Ho ritrovato mio padre qui e ora sono con lui finalmente. Non può più sfuggire alle responsabilità, ora è qui con me, non mi lascia mai solo ed è felice. Mi dice ora di aver capito che cos’è la vita, qual è il suo vero significato e mi stringe le mani, come se avesse paura che io possa sfuggirgli, scappare via, come lui ha fatto con me. “Che ci fai qui piccolo soldato?” mi domanda, ed è strano, è come un bambino ai miei occhi - sono addirittura più vecchio di lui - talvolta mi fa pena, ma lo amo tanto e lo rassicuro che non lo lascerò mai solo. Anch’io sono sorpreso e non so rispondere. Ci guardiamo a lungo negli occhi, in silenzio, senza saper dire di più, attratti l’uno verso l’altro, accomunati dalla vita breve e all’uno e all’altro sconosciuta e da questo sangue che ci scorre ancora nelle vene e ci attira l’uno verso l’altro, che ci ha attirato fino qui. “Perché proprio ora, papà? Come mai proprio ora, quando avevo tante cose da fare, il nuovo disco da incidere, la mia nuova fatica per la quale avevo tanto aspettato, tanto viaggiato, studiato, sofferto, sacrificato?”. E nemmeno tu sai rispondermi, povero papà, che te ne sei andato così stupidamente una sera d’estate. E mi sento solo. E vorrei che mia madre fosse qui ora e mi aiutasse ad essere forte e a ritrovare il coraggio che, a dir il vero, talvolta mi manca. E, quando la solitudine e le non risposte cadono ai nostri piedi, ecco la voce e ritrovo me stesso. La musica è tutto me stesso. Canto anche qui, con mio padre, le nostre voci si fondono ed è bellissimo solo così riconoscerci a pieno e scoprire quanto eravamo e siamo simili. Mi mancate tutti: ero così felice di vivere, un mito al contrario, morto di felicità. Giulia Cortella. Tema Semplice. Immagini dei temi di lobaaaato. Powered by Blogger.